The Duterte administration is set to launch 911, the Philippines' national emergency hotline number, on August 1 along with Hotline 8888. Before its nationwide implementation, 911 has been used in Davao City where President Duterte had served as mayor for more than two decades. In Davao, Central 911 facilitates police emergency assistance by dispatching mobile units nearest to the scene of emergency. It has its own Emergency Medical Services Unit manned by highly competent and well-trained Emergency Medical Technicians who cater to pre-hospital emergency medical care. The 911 EMS unit also transports patients to medical facilities and its ambulance units are equipped with basic life support and life saving equipments. Central 911 likewise provides urban search and rescue, fire auxillary, and K9 services as well as trainings for first aid and basic life support, basic firefighting, water search and rescue, mountain search and rescue, road accident rescue, and high angle rescue. The general public can avail of these services for free. During the campaign period and after he won the presidential election, Duterte promised to implement 911 on a nationwide scale. On July 20, the National Telecommunications Commission (NTC) issued Memorandum Order 07-07-2016 assigning 911 as the emergency hotline number nationwide. On July 21, the NTC issued Memorandum Circular (MC) 06-07-2016 making code "911" available for the use of the Philippine government. "From Aug. 1, 2016, all public telecommunications entities shall route '911' calls to the existing PATROL 117 Command Center until the new 911 Command Center is established and made operational. Thereafter, all '911' calls shall be routed to the 911 Command Center," NTC Commissioner Gamaliel Cordoba said. 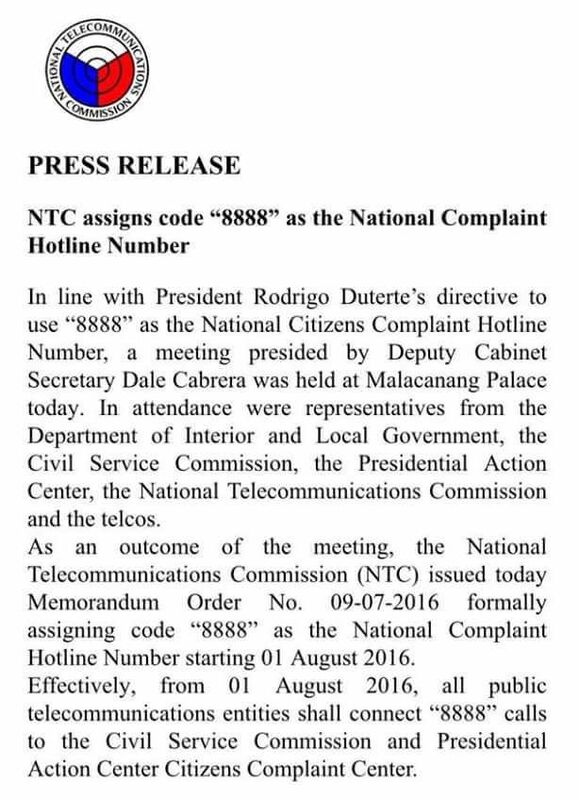 The NTC urged the public to refrain from making prank calls to the National Emergency Hotline Number. Earlier this month, the Department of the Interior and Local Government, the Department of Information and Communications Technology, and NTC inked an agreement with telecommunications companies PLDT and Globe for the transition of the existing Patrol 117 to the new 911 system. 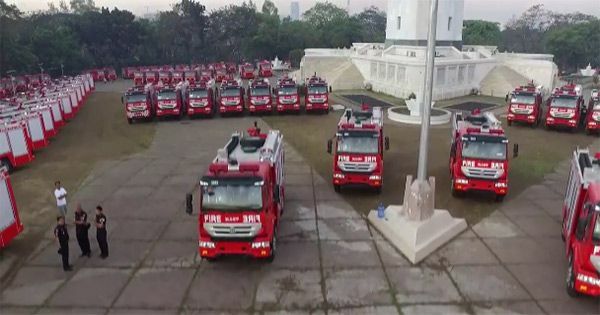 The 911 Philippines Facebook page, on the other hand, said in a post that they are ready to respond to disasters and emergency situations such as fire, typhoon, earthquake, landslides, tsunami, flood, terrorist attack, civil disturbance, riot control, search and rescue, and vehicular accident. Aside from 911, code 8888 will also be launched next month. Presidential Communications Secretary Martin Andanar said the 24-hour 8888 hotline will be used to receive public complaints.